RadChartView offers more than 20 of the most frequently used technical indicators out of the box. The indicators compilation contains representatives of the moving average, momentum, volatility, and band categories. In their essence, indicators are line series that calculate each of their values using predefined interpretations of the incoming data. The simplest example would be the Moving Average, aka. 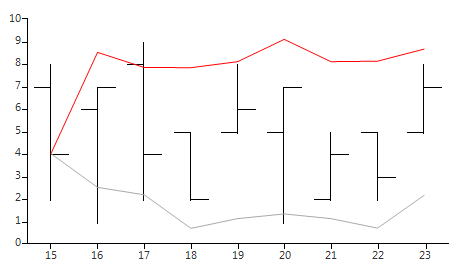 Simple Moving Average, indicator, which averages the data for a certain number of past days. Each indicator type introduces a specific set of properties that allows you to change the parameters of the built-in formula. This article demonstrates how to setup two of the most popular indicators - Moving Average (MA) and Bollinger Bands. 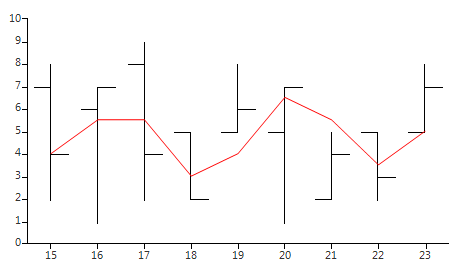 Each value of MA is the average of past n days, where n is a parameter defined by the Period property. N is defined by the Period property. A typical value for N is 20. K is defined by the StandardDeviations property. A typical value for K is 2.